3 Weeks to a better business plan! Stop sitting on your business idea. This laser-focused quick-start program is all about getting you up and running with everything you need to get your brand out there and on track to making moola! Who is LGIG for? Creative, aspiring entrepreneurs who have a great small business idea or freelance venture, and want to laser-focus on the first couple steps to get it off the ground. And given that you’re employed in another career full time, you could use a little help with motivation, time management and accountability as well. Who is LGIG not for? The next Mark Zuckerberg, those with an already-established business, or anyone looking towards entrepreneurship as a loose, last resort solution to unemployment or career dissatisfaction. A clear vision of what you want your business to look like in terms of your “Who, What, Where, Why and When”. 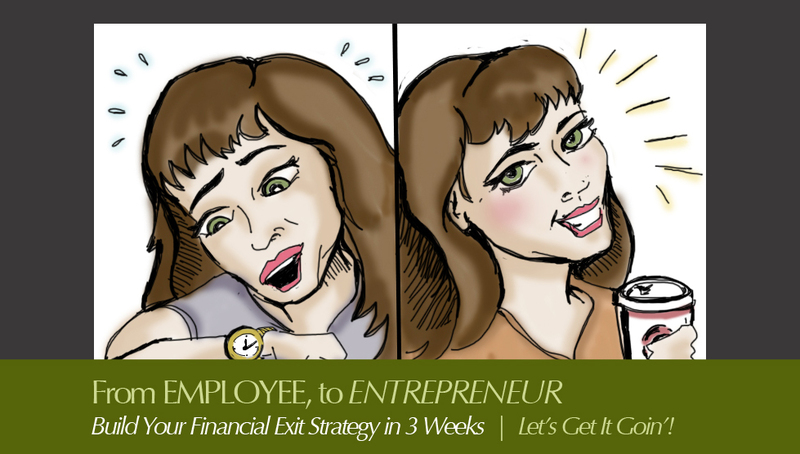 A solid exit strategy that creates clarity around what that actual transition from Employee to Entrepreneur will look like for you (your “How”). A plan for moving forward into the next phase of decision making, brand building, marketing, sales and growth. CREATIVE & COMPREHENSIVE WORKSHEETS & TOOLS to put your ideas into action. ONGOING EMAIL COMMUNICATION (read: I respond to all your emails in a timely manner) between sessions for ongoing feedback, advice and support. ACCESS TO ADDITIONAL “MEMBERS ONLY” DISCOUNTED PACKAGES to keep the work flowing and continue the process.